A thermoacoustic device uses sound waves to move heat from one place to another or use heat to create sound waves. 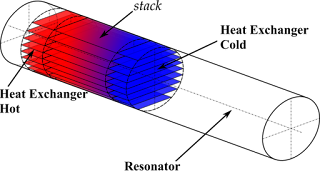 Using this principle, a thermoacoustic engine uses either the heat transfer or the sound waves to produce electricity, cooling, or heat pumping. Currently, researchers are looking into electricity created from pressure (piezoelectricity), refrigeration, and cryogenic applications. Another category thermoacoustics can be of use, is in the development of sensors, particularly backup sensors for nuclear reactors. The Fukushima nuclear disaster is a prime example of this. In the Fukushima incident, the power connections failed cutting off electricity to the backups, pumps, and sensor systems shutting them down. 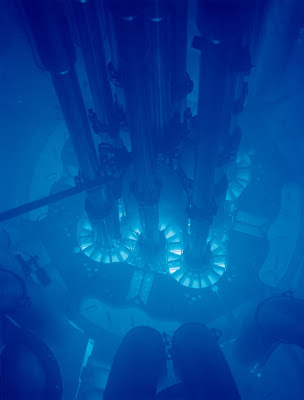 The reactors overheated due to the high radioactive decay heat and the nuclear plant's operators could not monitor the fuel rods in the reactor and spent fuel in the storage ponds. A thermoacoustic nuclear sensor would monitor microstructural changes in nuclear fuel, measure gas mixture composition, and to act as a fail-safe device in emergency situations. "Thermoacoustics exploits the interaction between heat and sound waves," explains Randall A. Ali, a graduate student studying acoustics at Penn State. "Thermoacoustic sensors can operate without moving parts and don't require external power if a heat source, such as fuel in a nuclear reactor, is available." Thermoacoustic engines can be created from a closed cylindrical tube -- even a fuel rod -- and a passive structure called a "stack." The stack is made from ceramic materials commonly used in catalytic converters found in cars. Stacks transfers heat and also converts it into sound in the presence of a temperature difference. When a thermoacoustic engine operates, an acoustically driven streaming gas jet circulates hot fluid away from the heat source -- nuclear fuel -- and along the walls of the engine and into the surrounding cooling fluid. This system is independent of any outside power source. Its usefulness shines during emergency situations during the threat of power loss. It does not really stop the problem but at least operators can still monitor the status of the reactors which gives them an idea and timeline on how to further deal with the problem. With the development of a nuclear reactor sensor independent of a power source, it is just one of many steps needed to truly guarantee the safety of everyone, including the environment in the operation of a nuclear reactor facility. The team will present their research at the Acoustical Society of America's upcoming 164th Meeting, October 22-26, 2012, in Kansas City, Missouri.